The FIFA Women’s World Cup set two new records for number of tweets sent per second. The final game between USA and Japan, which saw Japan winning over USA courtesy of a penalty shootout, set the new all-time high with 7,196 tweets per second. What topic holds the second spot you ask? 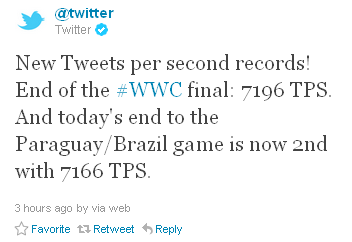 It’s the Paraguay vs. Brazil game for the Copa America 2011 with 7,166 tweets per second. Previously, the record for most tweets belonged to the New Year’s Day inJapanwith 6,939 tweets per second. And if you’re thinking that only men’s soccer is popular, you may have to rethink, as the Men’s World Cup 2010 Final only achieved about 3,051 tweets per second when Spain scored its winning goal in the final match. Other past topics in Twitterverse are the Japanese earthquake and Tsunami in March, where tweets reached 5,530 per second and the Royal Wedding in England in April, with 3,966 tweets per second.